Houston, TX (September 12, 2018): David Weekley Homes, the nation’s largest privately-held home builder, is participating in the master-planned community of Elyson’s Open House Spree, which will be held weekends September 15-30 from noon to 5 p.m. The community-wide event will feature 15 model homes, tours of Quick Move-in homes and activities and treats. Attendees will have an opportunity to tour Weekley’s model home, The Roth, showcasing the latest in design and décor trends as well as one- and two-story Quick Move-in homes from the builder that are priced from the $320s. These homes feature open-concept floor plans and options, including extended back patios, oversized garages with workshops and upgraded appliances and cabinets. The one-story Roth features a classic stone and brick exterior with four bedrooms and four full baths within nearly 2,700 feet of living space. The modern kitchen includes white and glass-front cabinetry, glass pendant lighting and oversized kitchen island, while the adjoining family room is punctuated by a bank of windows leading to the covered outdoor living area. The home includes an open study highlighted by a feature wall with built-in shelving, as well as unique paint treatments on the walls. Set on 3,600 acres in Katy, Elyson’s amenities include an amenity center with resort-style pool, fitness center, game room, an onsite café, children’s play area, event lawn and a trail system that connects the various neighborhoods within the community. The community is located in close proximity to the Grand Parkway and Energy Corridor. Students attend Katy ISD schools, including Katy High School. Elyson is developed by Newland Communities, which was recognized in 2017 with a PRISM Award from the Greater Houston Builders Association for the Master Planned Community Recreation Center of the Year in Elyson. For more information about David Weekley Homes in Elyson, contact 281-249-7802. 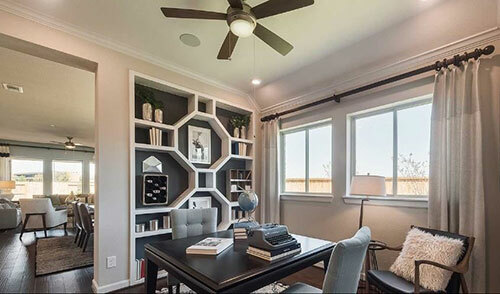 The model home is located at 23614 Providence Ridge Trail in Katy and is open daily for tours. The Roth model home from David Weekley Homes is part of the Open House Spree in Elyson.